When it comes to hair growth, I have almost seen it all. Sometimes desperate times call for desperate measures, especially when it comes to your edges. Too much manipulation can leave the edges of your hair visibly thin, and that is not cute for anyone. Many women massage their scalps with an oil or treatment to encourage blood flow to that area. Another way to stimulate blood flow is derma rolling. It sounds harmless, but when you realize it involves needles then the thought could have you running for the hills. Do not fret, it is not a torture device. In fact, it might just be your best friend...maybe. The visual can cause anyone to cringe but there is a reason for rolling little needles on your scalp. The derma roller is a small rolling device that has little needles attached to the rolling section that you roll onto your scalp. The visual can cause anyone to cringe but there is a reason for rolling little needles on your scalp. According to research, when gently rolled onto the scalp the derma roller gently penetrates the first layer of your thick scalp to exfoliate, massage, and ultimately stimulate hair growth. The purpose of it penetrating the scalp is to stimulate the skin and release toxins from the scalp. “It basically promotes new tissue growth, and it does it very simply, with simple trauma," stated Dermatologist Dr. Duffy in New York Magazine. But not all doctors agree, as some are not convinced it works well enough. Consequently the only way to know for sure is to do your own research and experimentation. The main benefit of this device is hair growth. Many people use it to stimulate hair growth on their thinning edges. It is also used to help stimulate eye brow growth and for stretch marks. In fact, many people use it in place of laser procedures to fix scalp and skin issues such as cellulite. Let's face it, nobody likes needles but these are not the same needles used at the doctor’s office. There are just long enough to penetrate the scalp, but not too long to cause any damage. How thick are the needles? The needle gauge varies according to whom you purchase your derma roller from. It is best to do your research to see which gauge and which brand would work for you. If the gauge is too thick for the part of your body you are treating, then it could cause damage and scarring. If the needles are too thin, it will not penetrate the scalp and do the job it is meant to do. 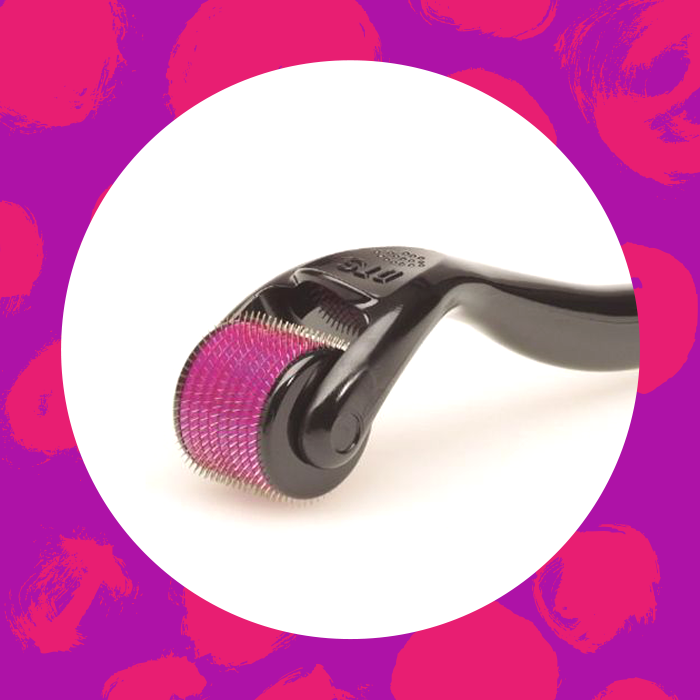 The derma roller is a unique device and can seem a bit scary at first, and is definitely not for the faint of heart. If you are a little daring then you may find that the derma roller works for you. Sometimes, beauty has a price. If not, there is always the good old scalp massage. No needles necessary. Will you be derma rolling your edges?